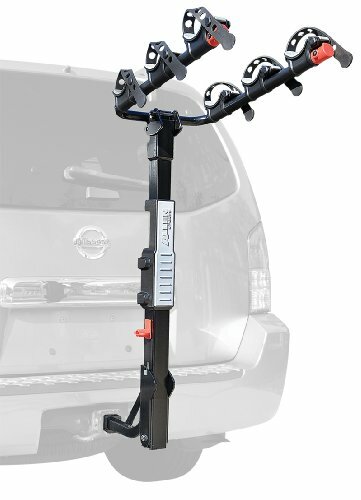 Allen Sports' Premier Hitch Mounted 3-bike carrier mounts quickly and easily to your 2" or 1 1/4" trailer hitch. The arms "snap" into place right out of the box. Allen's new dual-compound cradle system securely holds your bicycles in place and the rack's large padded Spine Shield protects your bicycles as well. In addition to the easy folding arms on this rack, the new innovative internal tilt-away release makes it a snap to access your vehicle's rear lift gate. The powder-coated rack installs in just minutes with a no-wobble bolt and an integrated locking loop offers a place to secure your bikes.